Livestand from Yahoo! is powered by Cocktails, and is a peek of what Cocktails can do. The Livestand team develops on Mojito using a desktop browser, and packages for the iPad by embedding a web runtime which includes a native shell for managing web views. The same Livestand application that runs on the iPad also runs on Manhattan. This allows the app to offload some of the complex and time-consuming processing to Yahoo!s cloud. Yahoo! plans to open source Mojito through the Yahoo Developer Network in the first quarter of 2012. Manhattan will be available later in 2012. To take a quick peek of Cocktails, watch the Yahoo! Mojito and Yahoo! Manhattan Demo. 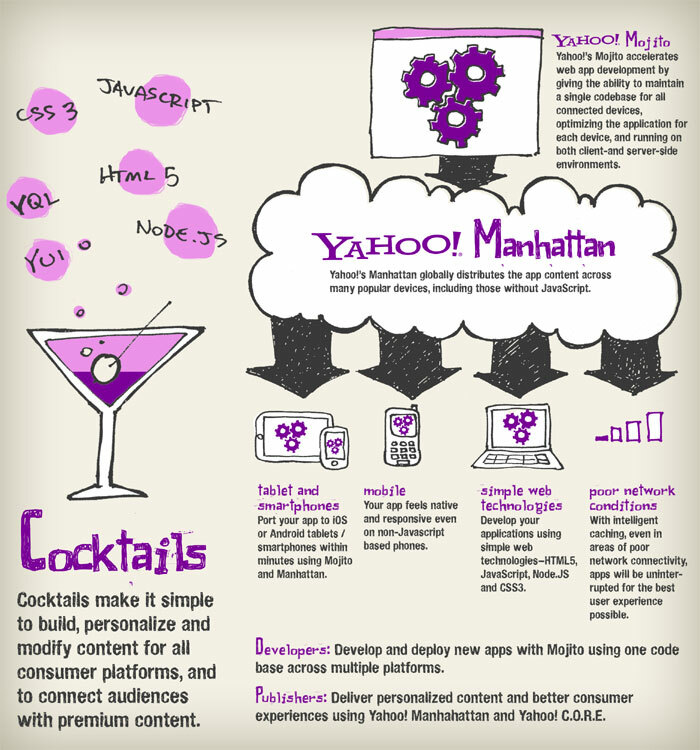 There's not a lot of information for developers at this time, but the blog post titled "Yahoo reveals their Node.js Mojito Manhattan cocktail mix - now I can talk about it?" by David Herron, author of Node Web Development, gives us a little information of how things worked before he left the Cocktails team in June.